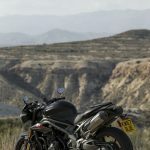 It was a sad day in southern Spain, not to mention a long way to travel, to be peering out from the garage as intensifying rain dashed any hopes of spinning another lap around the Circuito de Almeria. 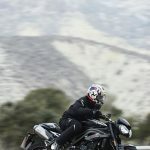 With only a single session under our belts, and that one merely a familiarization one at best, there was nothing left to do except get wet on the ride back to the hotel. 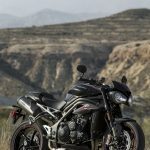 On the bright side of the dampening gloom was a first half of the day spent flogging the 2018 Triumph Speed Triple RS around a variety of delicious Spanish backroads, sampling its arsenal of upgrades, especially those of the electronic variety. 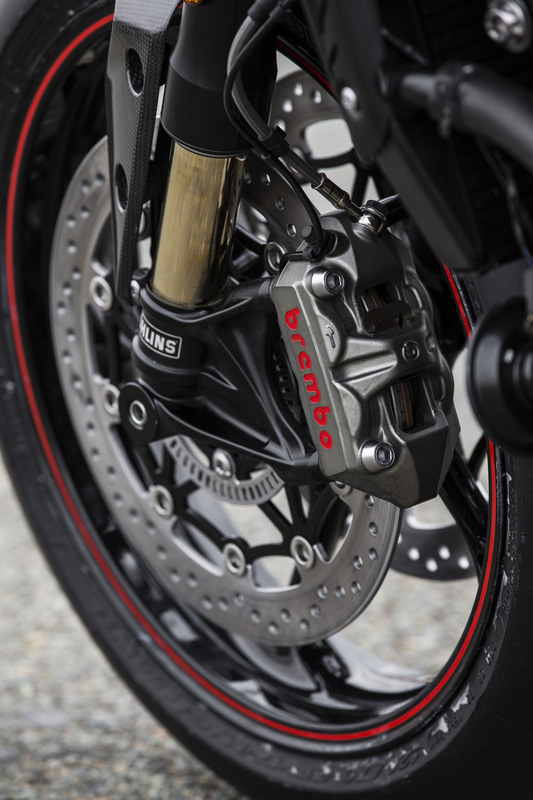 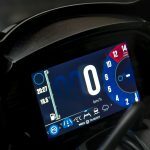 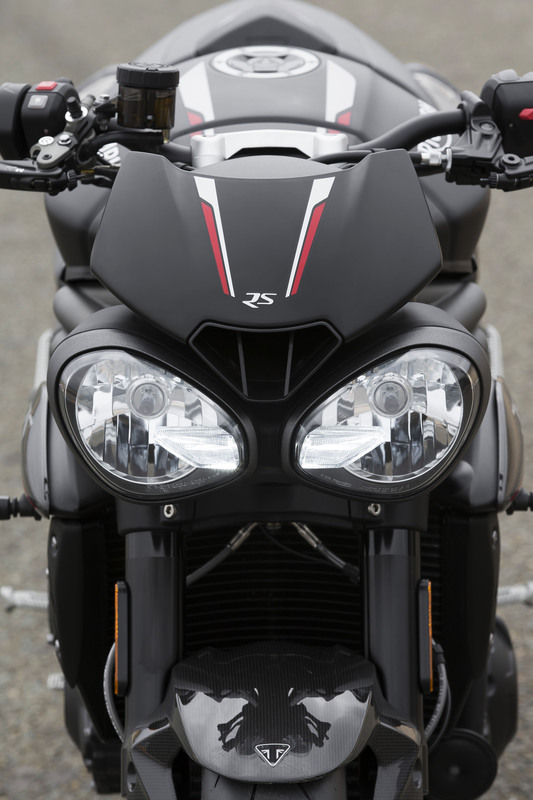 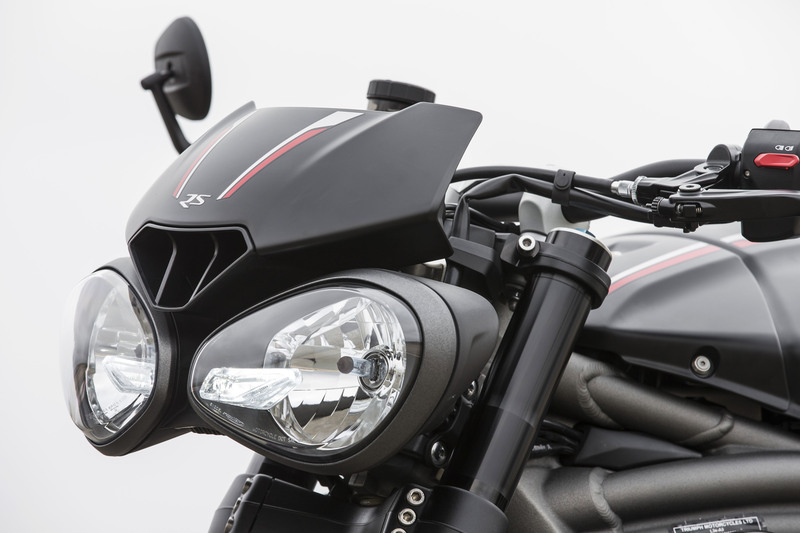 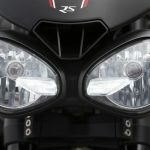 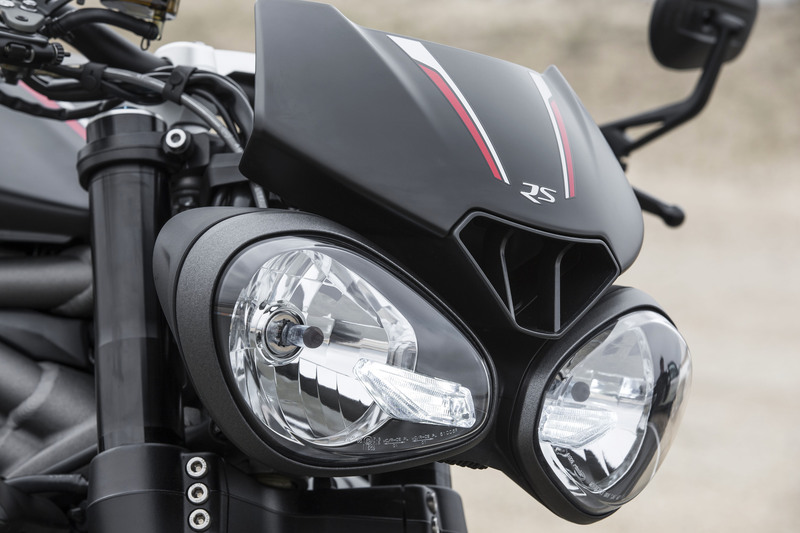 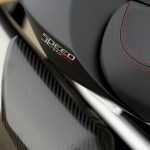 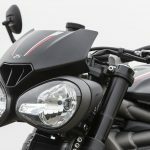 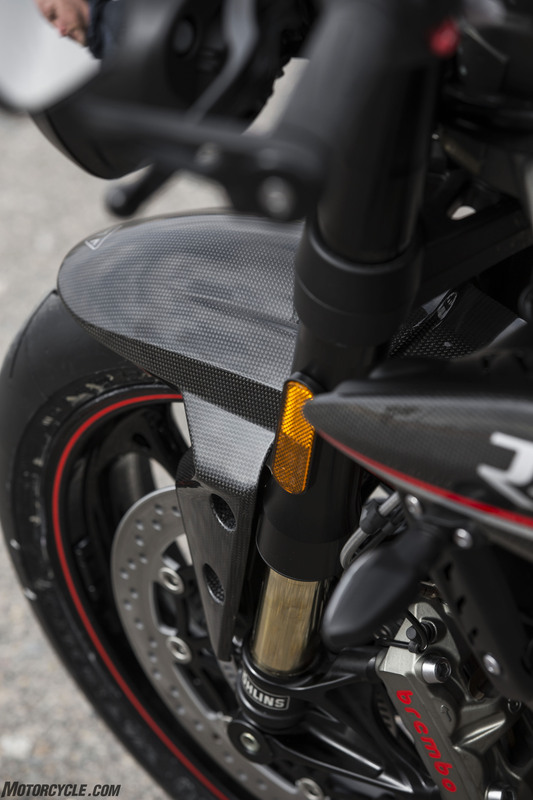 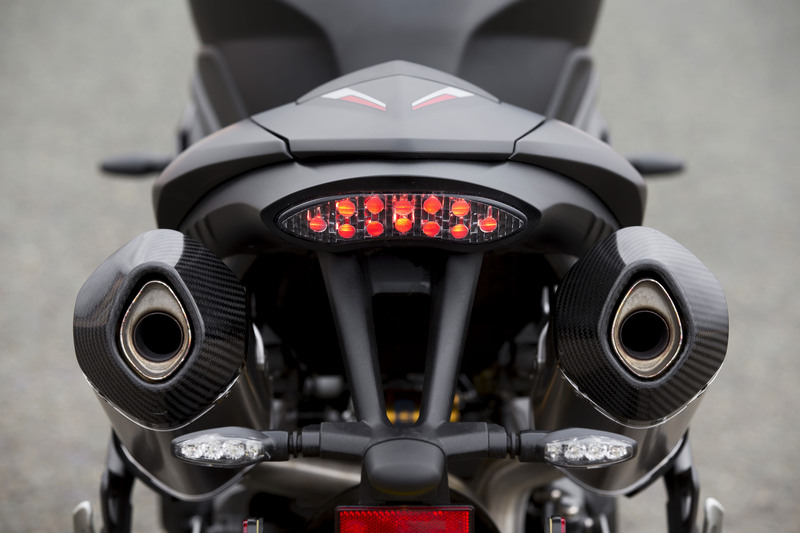 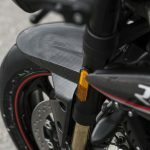 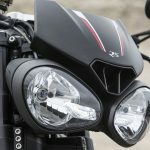 Endowed with cornering ABS and cornering traction control thanks to a new Inertial Measurement Unit (IMU), as well as a variety of riding modes and cruise control, all visible and selectable via an eye-pleasing full-color TFT display (first seen on the 2017 Street Triple), the new Speed Triple now stands on equal electronic footing with the likes of competitors such as Super Dukes, Tuonos and FZ/MT-10s. 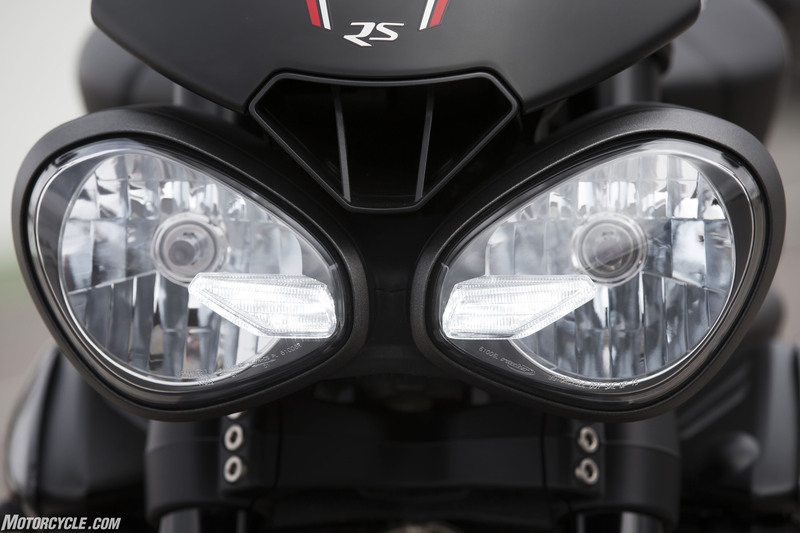 A nicety found on both the S and RS models is backlit switchgear. 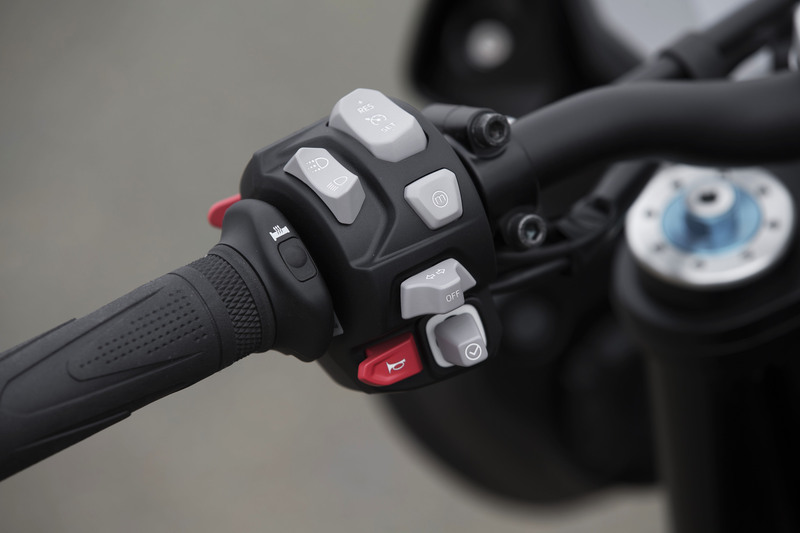 From the left handlebar, accessing the bike’s menu of ride modes and individual settings for ABS, TC, etc., as well as cruise control is an intuitive process requiring little familiarization. 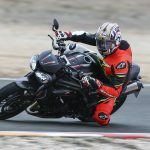 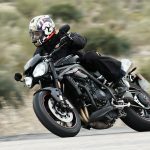 Fireball Brasfield wonderfully detailed the litany of upgrades and new features the 2018 Speed Triple enjoys in his preview article, so we’ll dispatch with pointless reiterations and move on how well the Speed Triple works in a street environment, and further lament the ill-fated weather that robbed us of our track impressions. 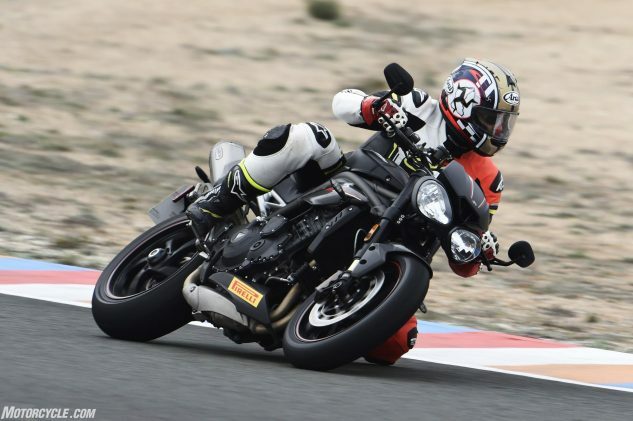 In 2016 Triumph claimed 104 new engine parts when John Burns and gang last reviewed it during a multi-streetfighter shootout to and from the World Superbike races at Laguna Seca, where the S model placed second behind the Tuono V4 Factory. 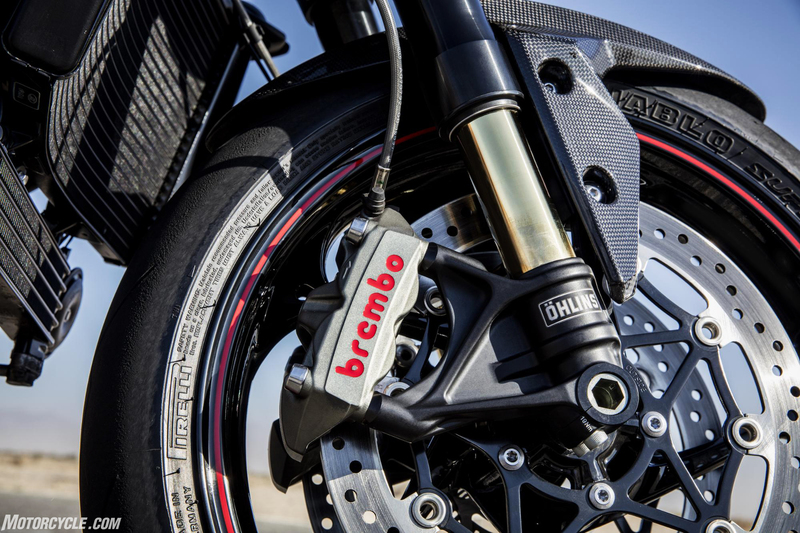 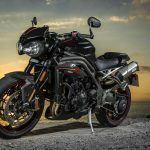 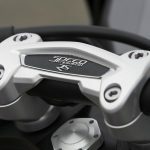 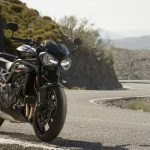 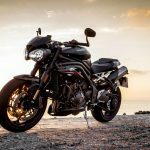 Two years later the British OEM has outdone its own amount of new engine bits and pieces by one, endowing the 2018 Speed Triple with 105 new engine components. 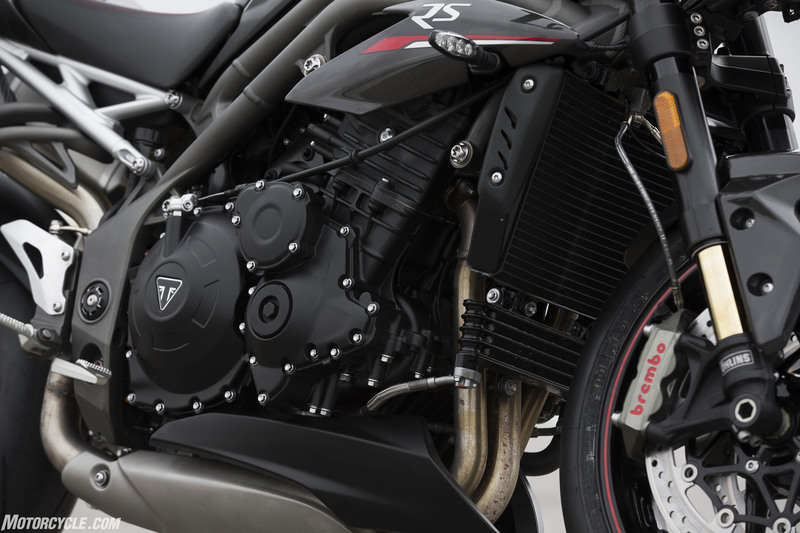 The result is a claimed seven percent increase in horsepower and four percent increase in torque, which should result when dyno tested to a half-dozen more horsepower and a half-as-much increase in lb-ft of torque compared to the 2017 model. 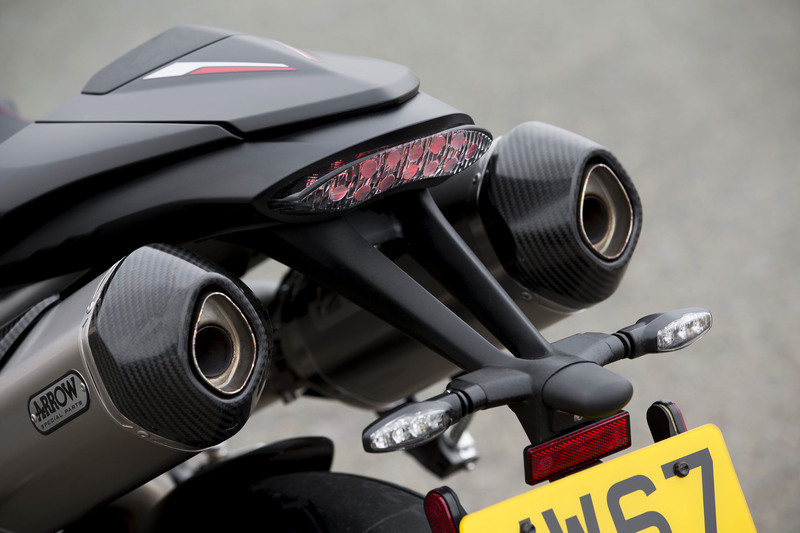 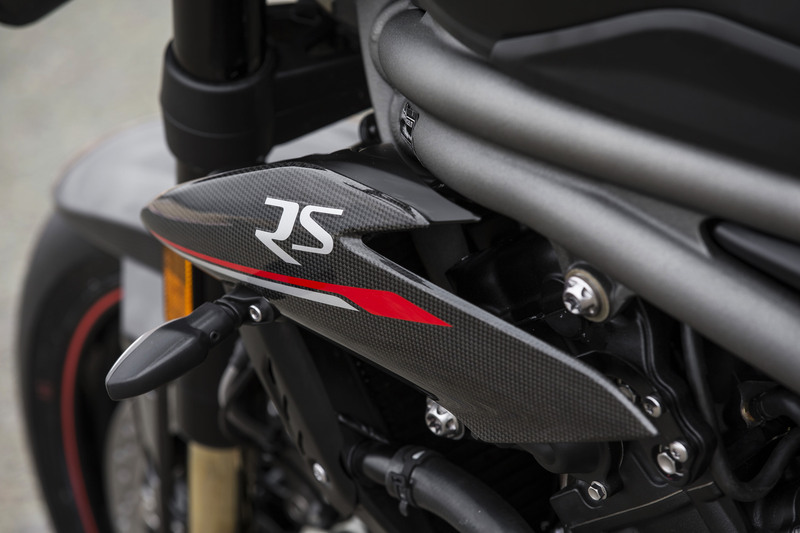 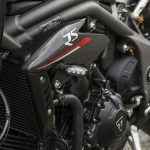 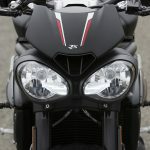 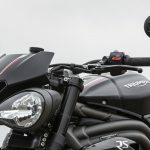 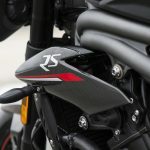 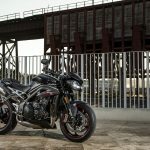 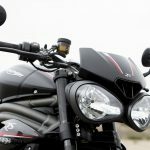 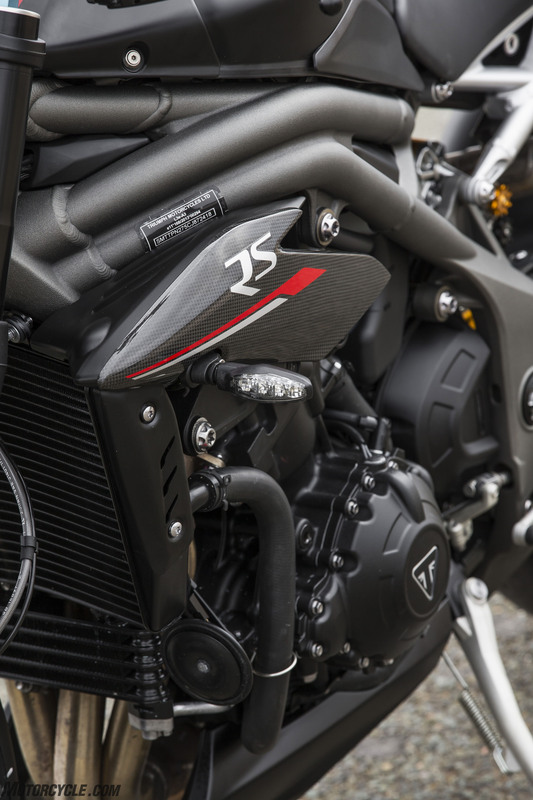 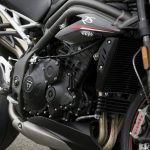 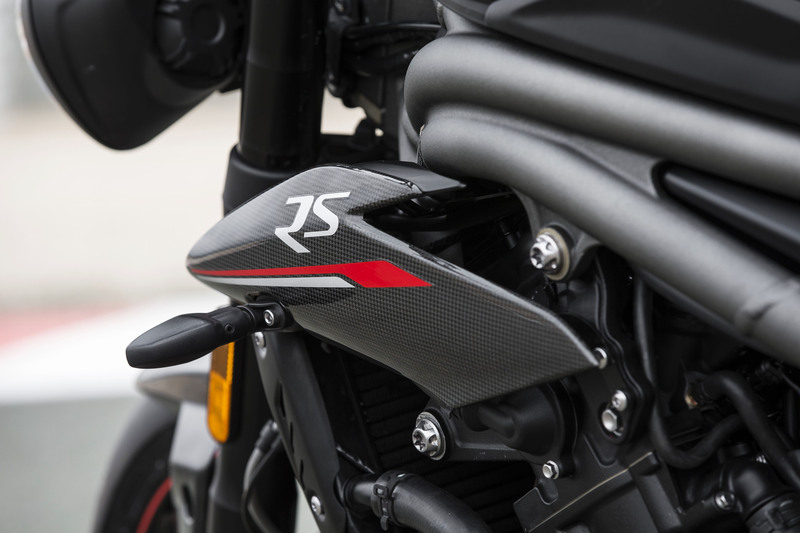 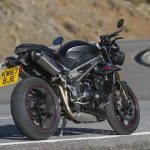 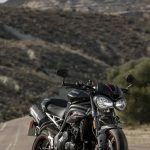 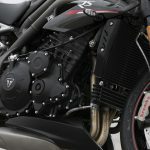 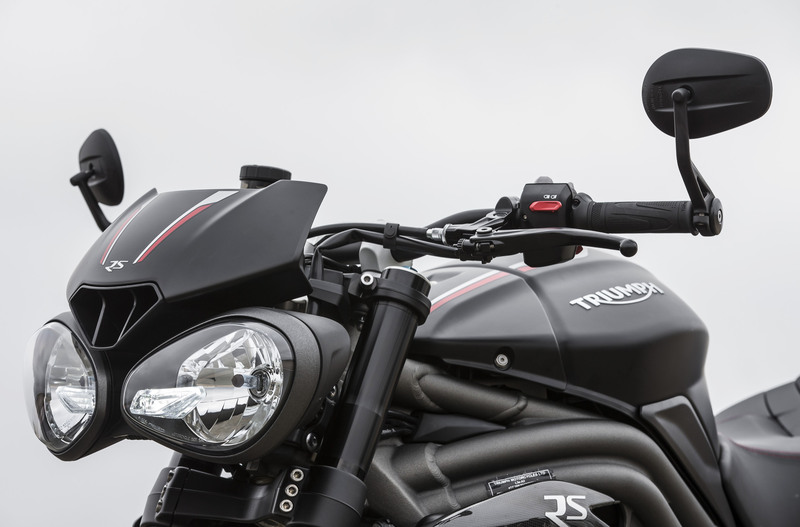 Triumph also claims a six pound lighter dry weight on the RS model (mostly due to the lighter Arrow exhaust cans), while the S model remains relatively the same weight as before at 423 pounds dry (MO measured wet weight of 478 pounds). 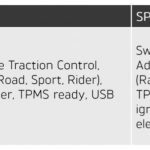 More power and less weight are always welcome, but it’s not enough of a power increase/weight decrease to be conclusively noticeably without last year’s model on hand with which to make a direct comparison. 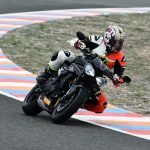 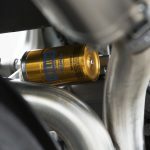 However, the engine does spin 1,000 rpm higher, and even being robbed of our track day, it’s no leap of faith to think that this won’t be anything but beneficial at the track or even during spirited street rides. 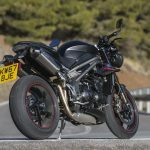 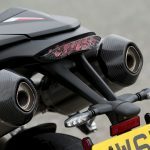 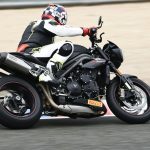 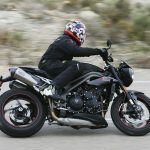 “Some of us were wishing Triumph allowed it to rev out a little further than its 10,000-rpm rev limit,” John Burns commented in his multi-streetfighter shootout. 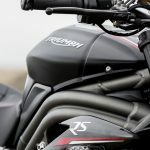 You got your wish, Burnsie. 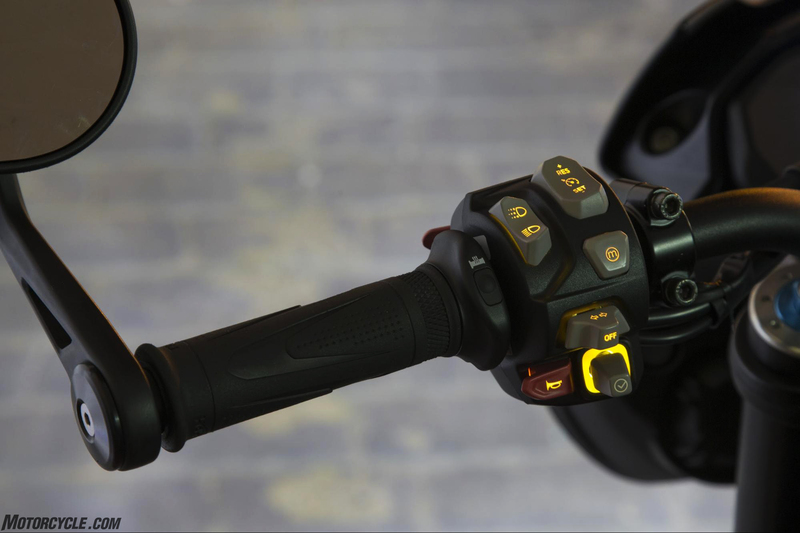 Only Rain mode reduces power output to a claimed 100 hp, the other settings change the throttle map’s aggressiveness of power delivery. Rider mode allows you to customize the settings according to your personal preferences. 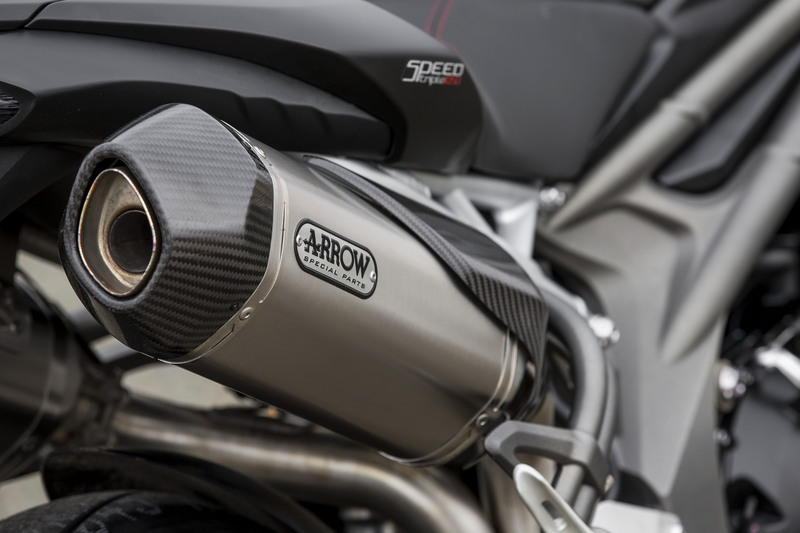 What certainly remains, and improves, is the Triple’s broad spread of power throughout the rev range. 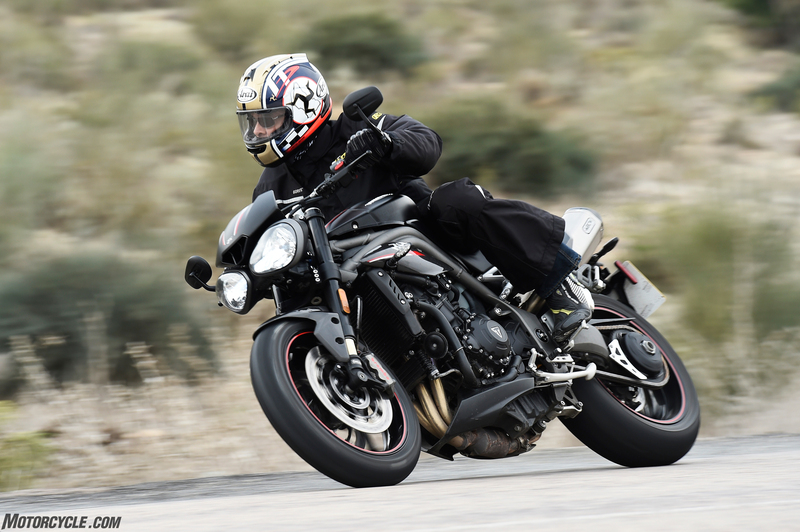 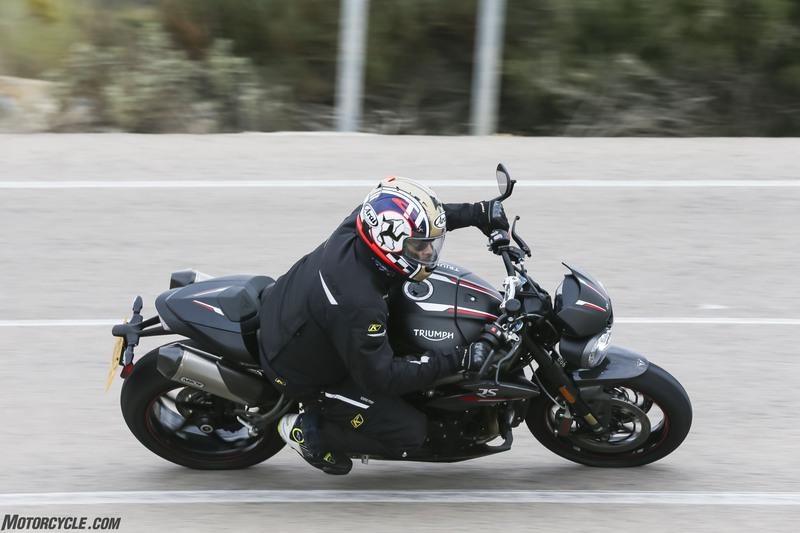 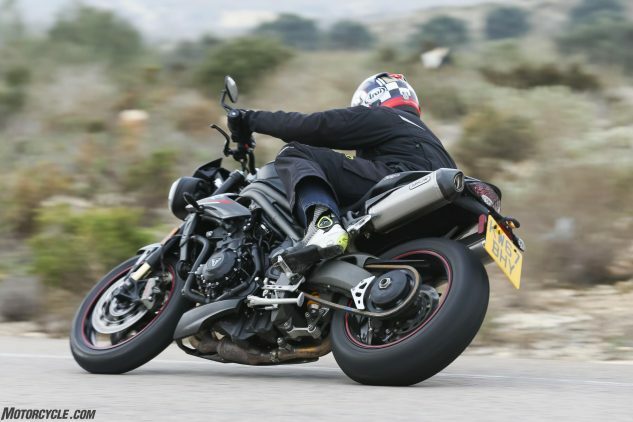 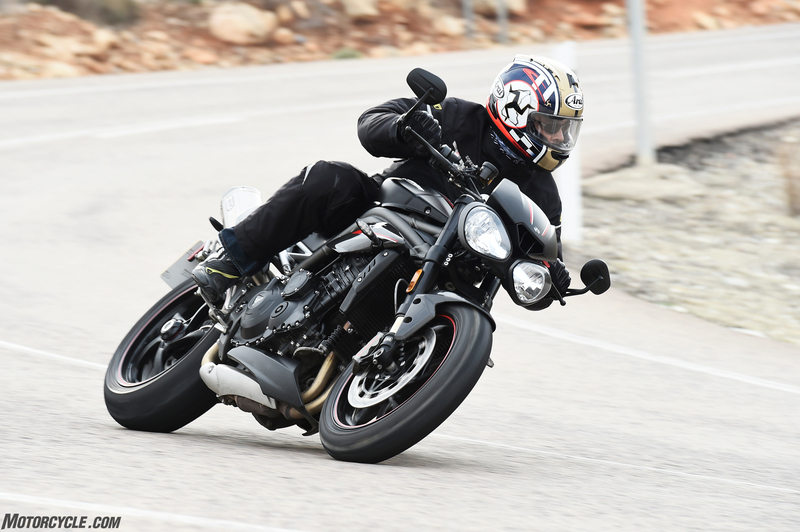 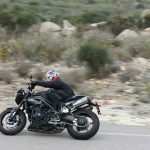 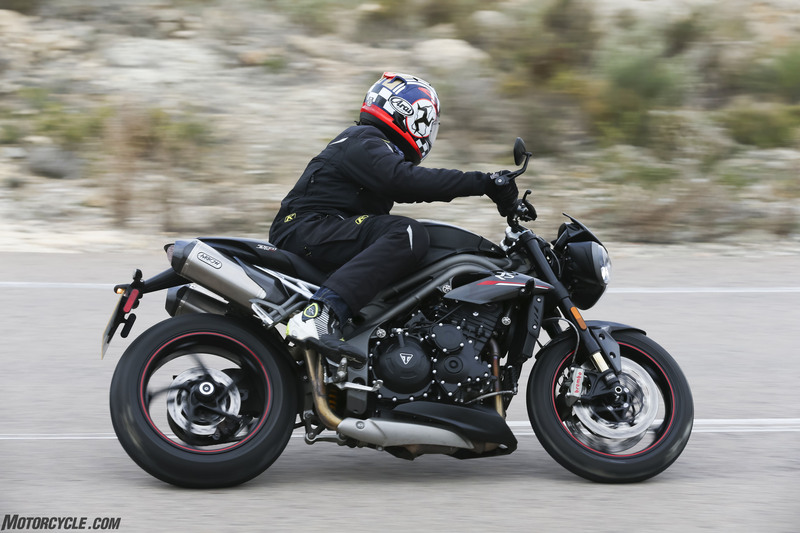 From our 2016 Naked Sports Six-Way Shootout we know the Speed Triple already produced the second-most low-end torque next to Ducati’s Monster 1200S while being out-displaced by 148cc. 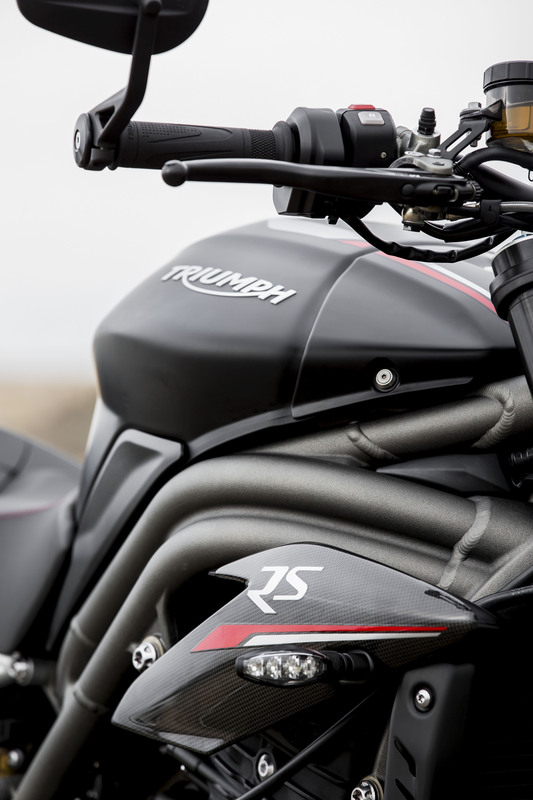 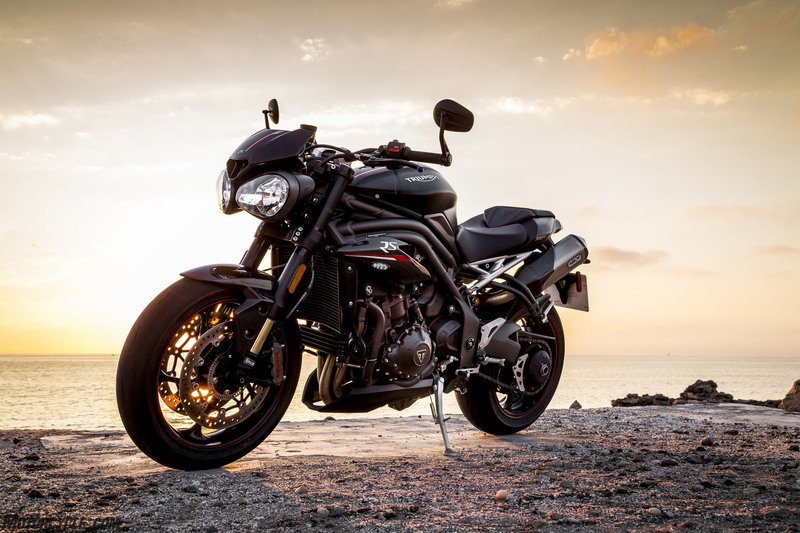 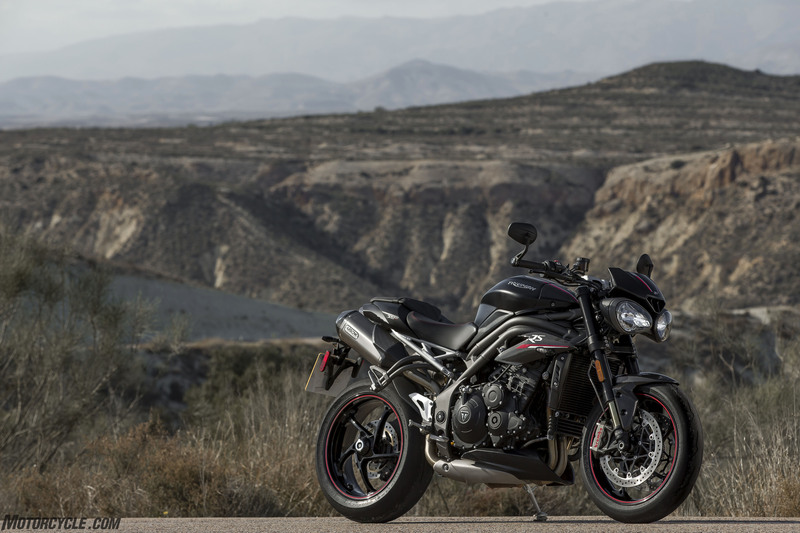 It wasn’t the torquiest engine, but the Speed Triple delivers more torque where it counts compared to other nakeds. 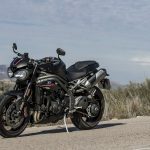 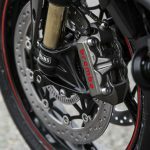 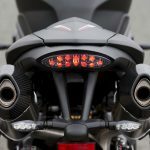 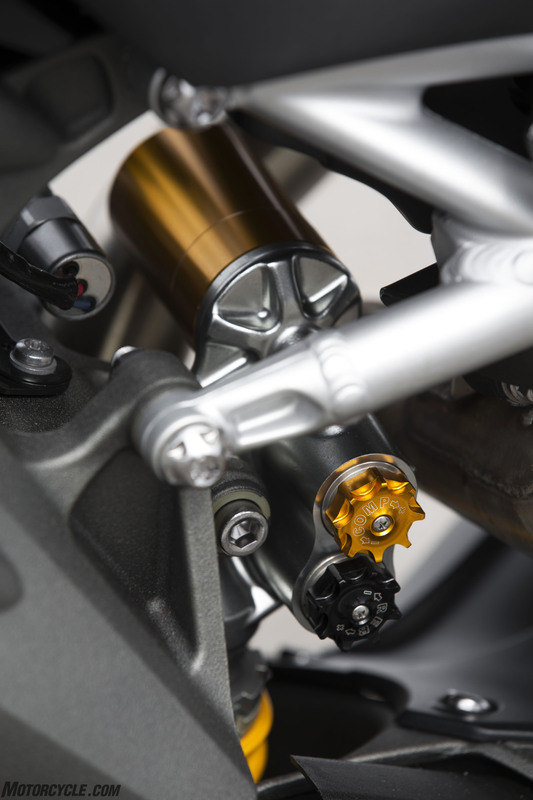 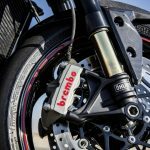 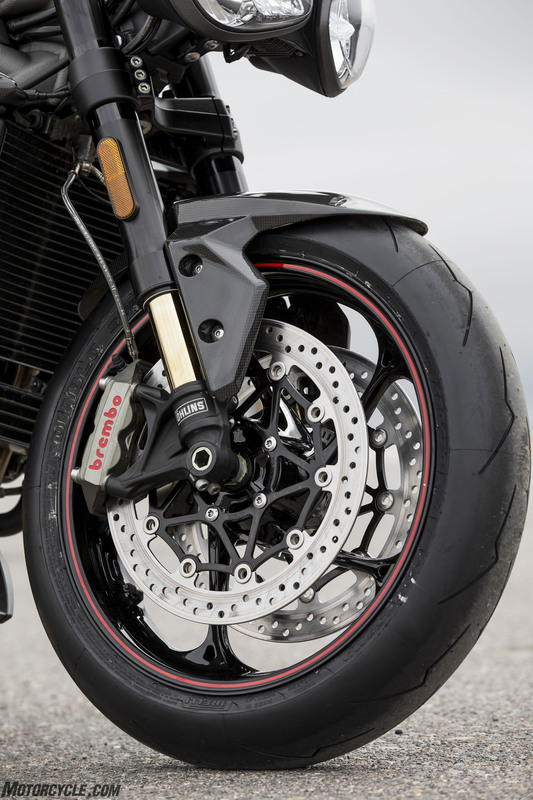 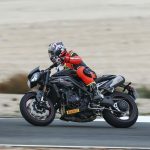 In the horsepower department, six more ponies will put the Speed Triple equal to that of the Monster 1200S and Kawasaki Z1000 at 130 hp, but well below the Tuono’s rear wheel measurement of 160 hp. 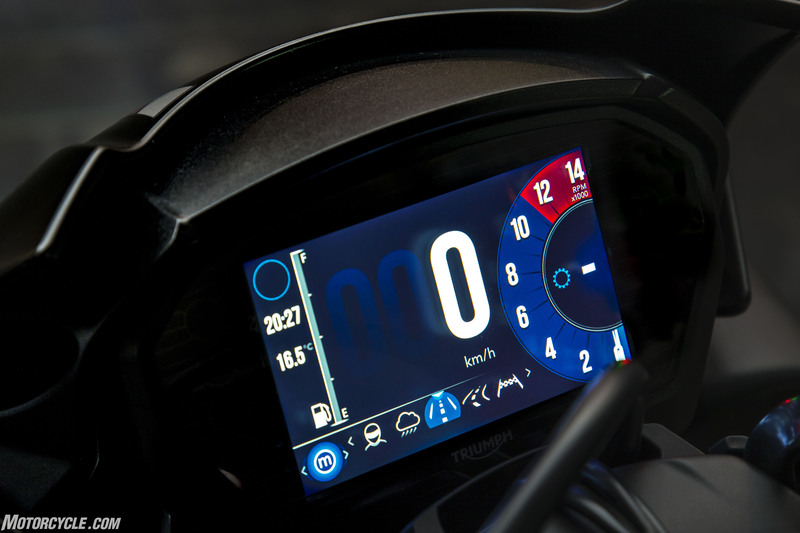 The variety of damp, dry and wet roads provided ample opportunity to use the rider modes for their specific situations. 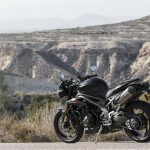 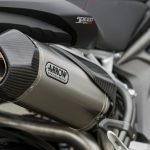 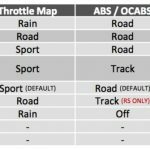 Engine response, TC and ABS settings – switching from Road to Sport to Rain – all seemed perfectly matched to the environment and riding style of the given situation. 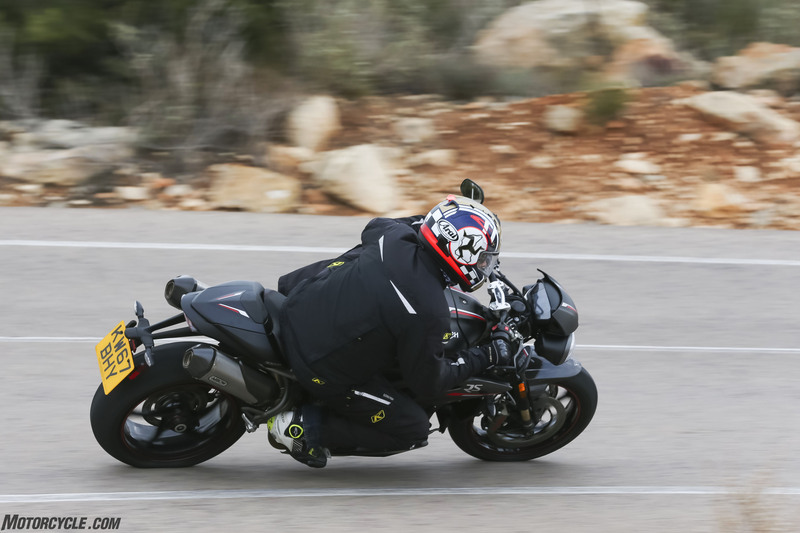 Considering the amount of wet we had to deal with, the Rain setting especially seemed perfectly designed for delivering the right amount of everything providing a rider the confidence needed for dealing with tricky weather/pavement conditions. 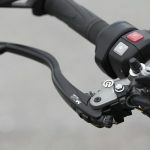 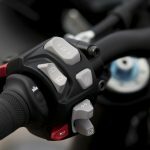 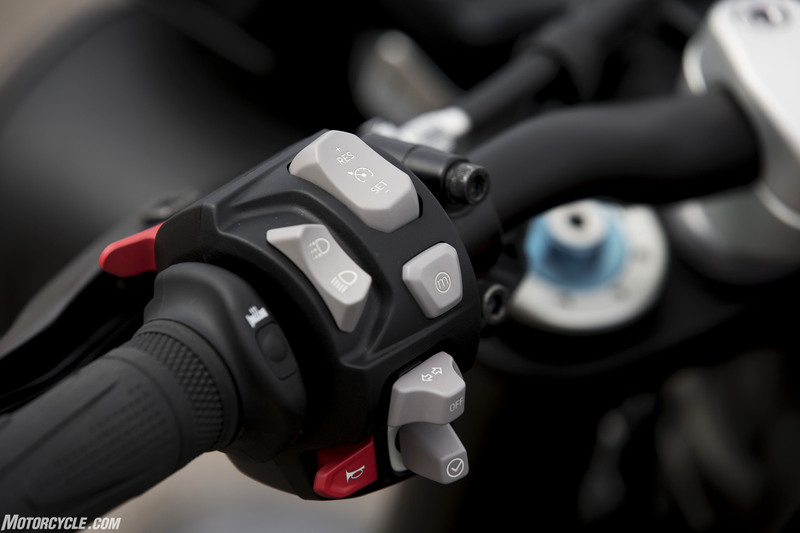 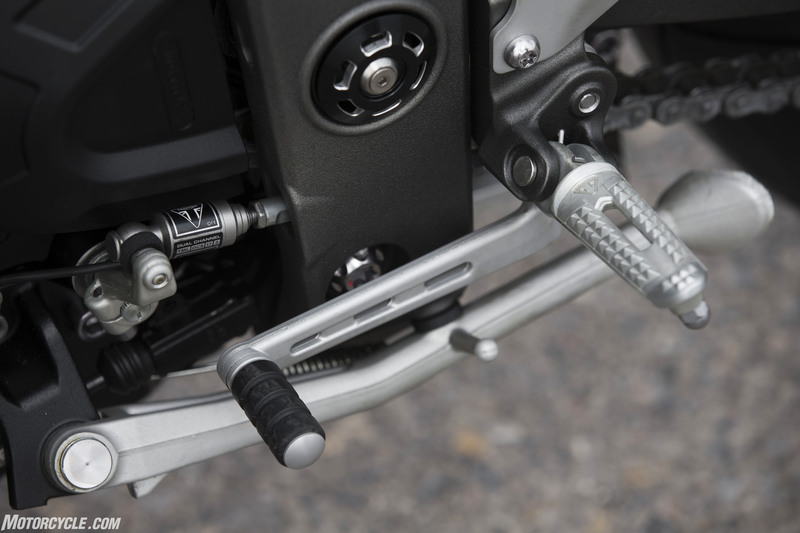 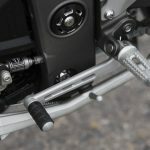 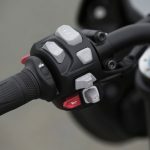 Not only does the front brake lever adjustable for distance from the handlebar via the dial at the end of the lever, but the barely visible dial on the inside of the lever adjusts the firmness of the action. 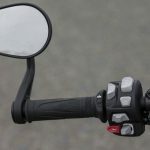 For example, when it was wet I’d set the lever to be squishier for better feel at slower speeds when the front tire is more prone to washing out, while under dry conditions at higher speeds a firmer setting was preferable. 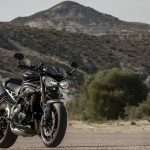 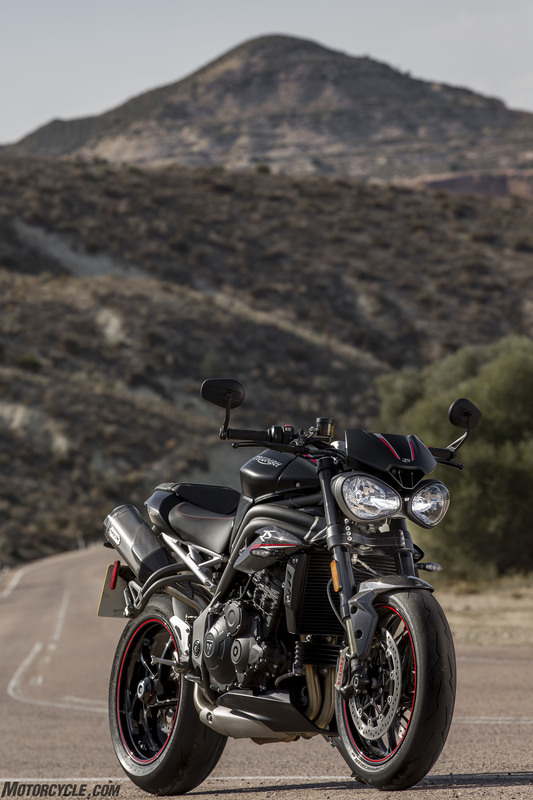 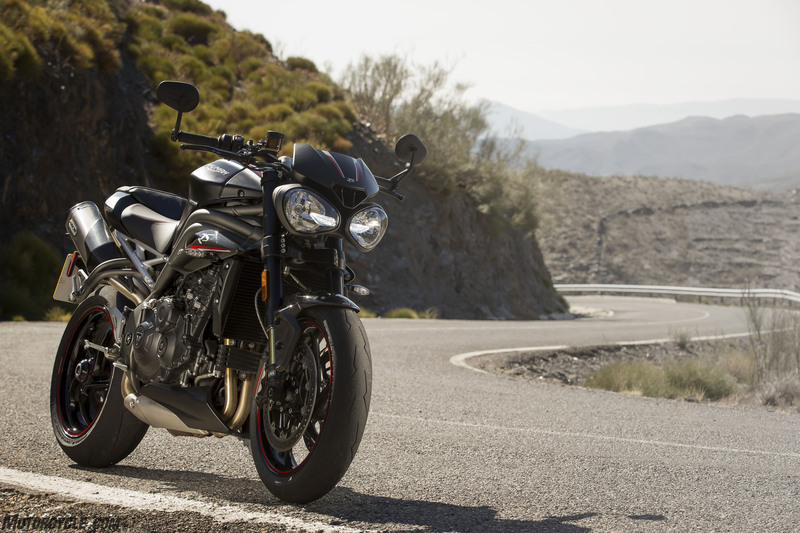 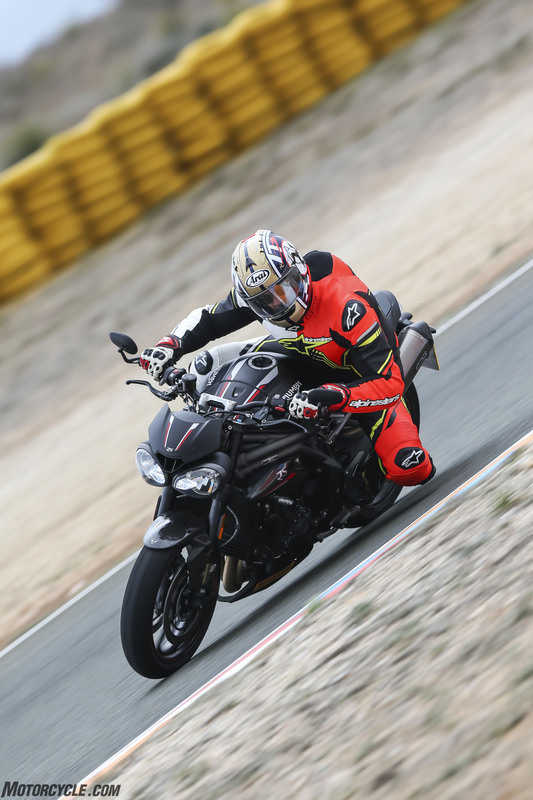 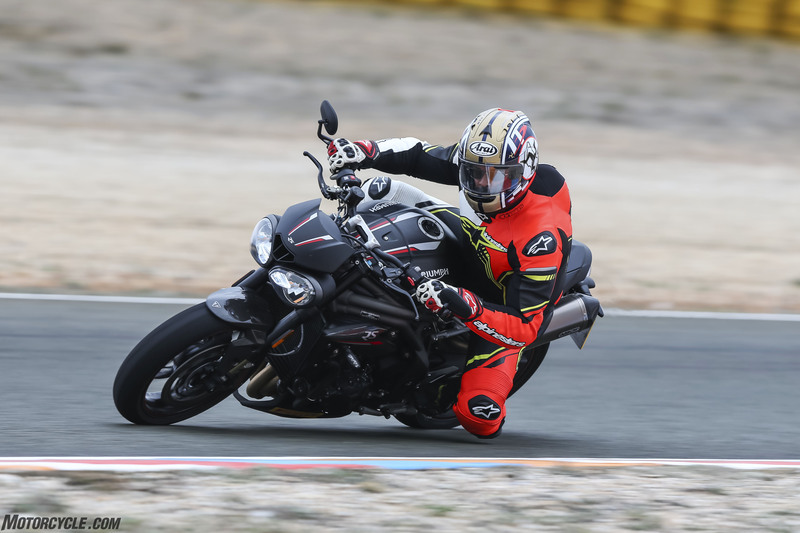 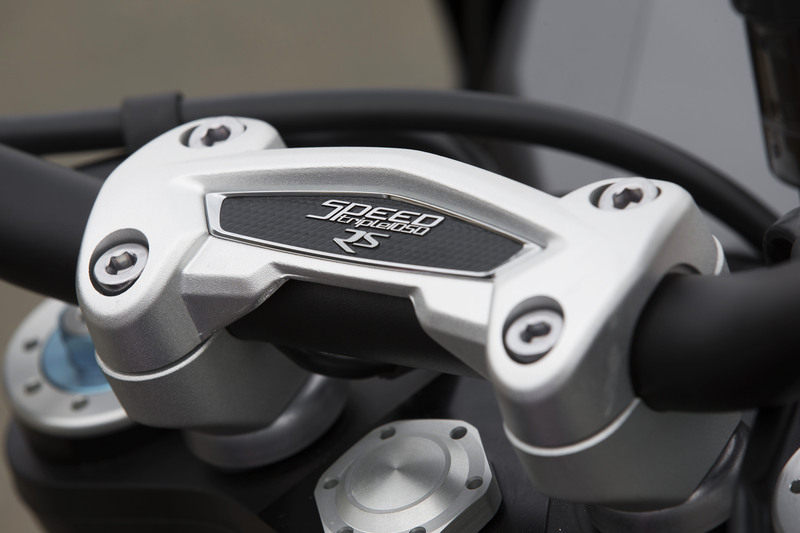 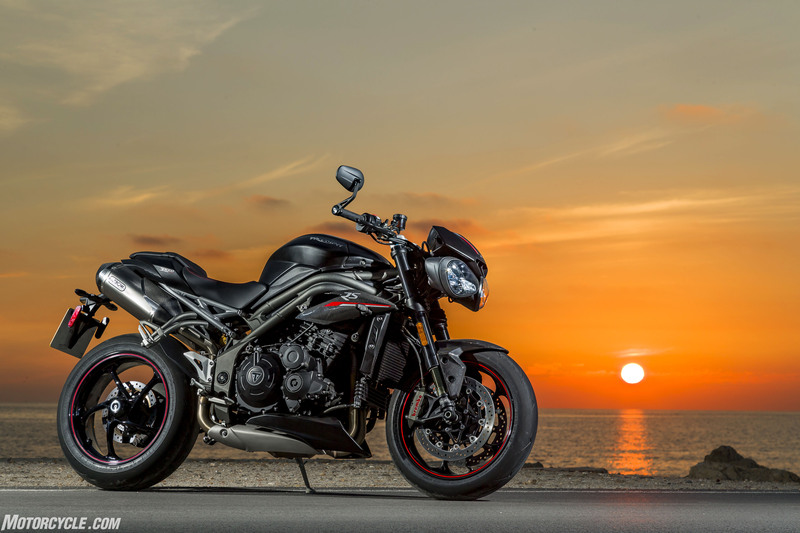 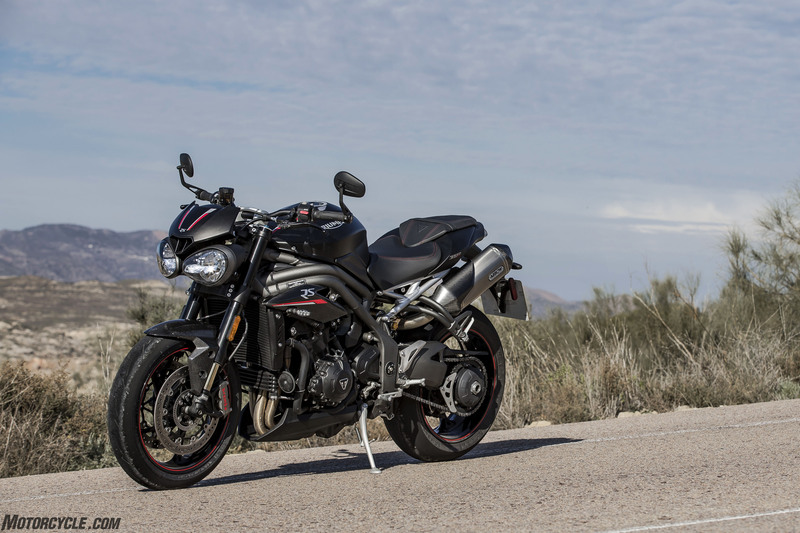 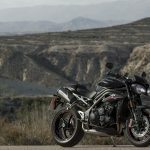 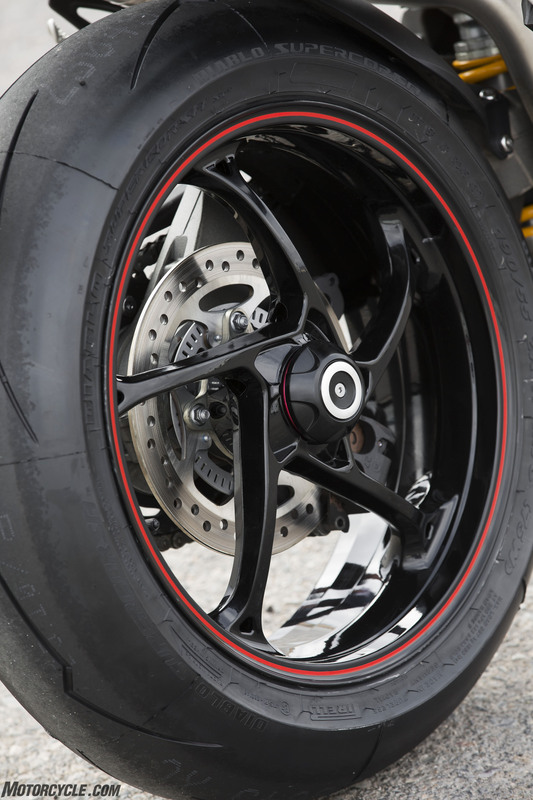 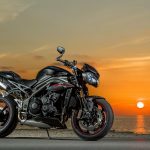 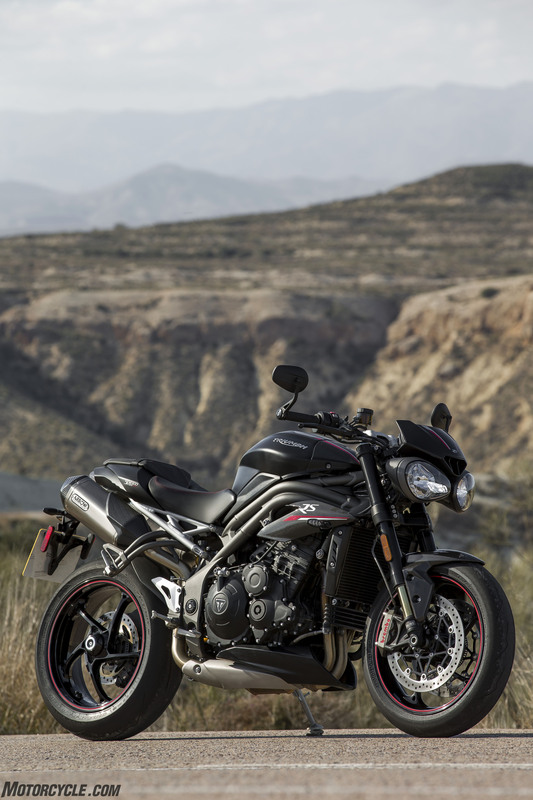 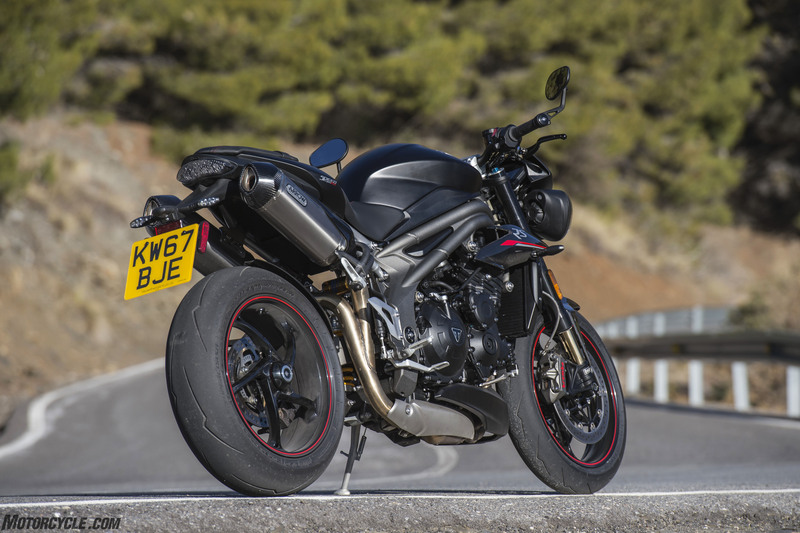 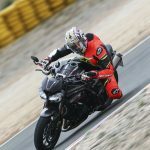 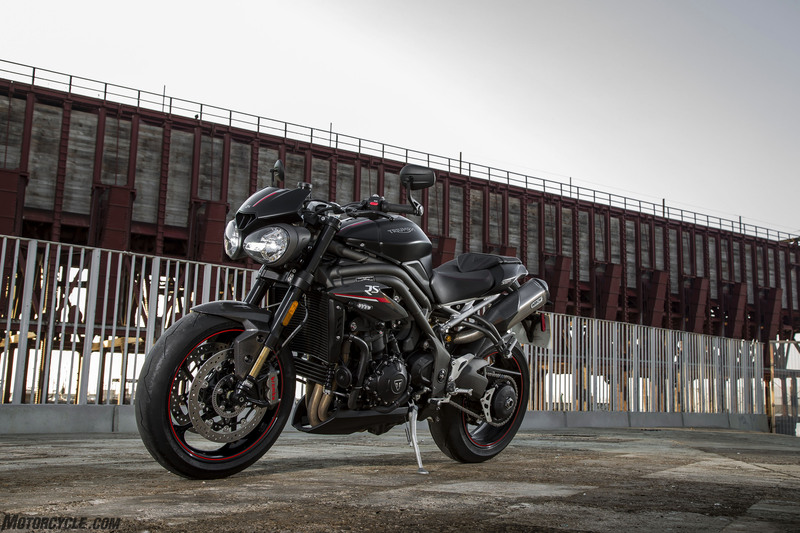 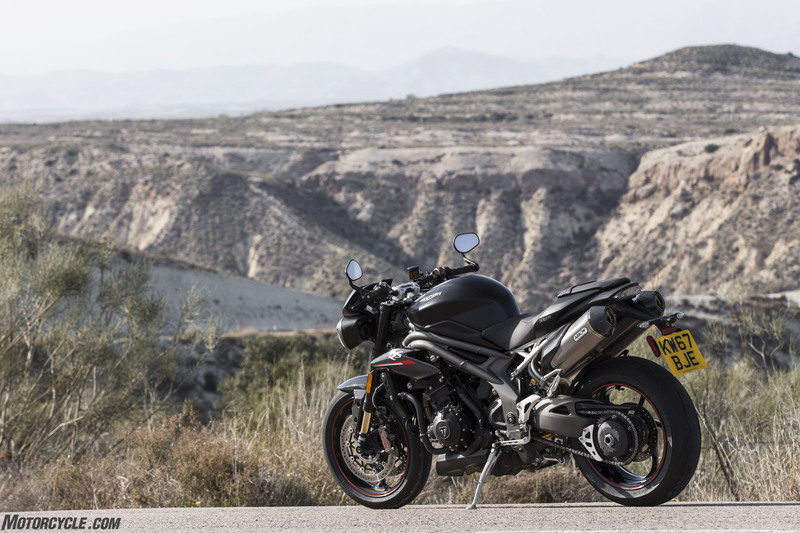 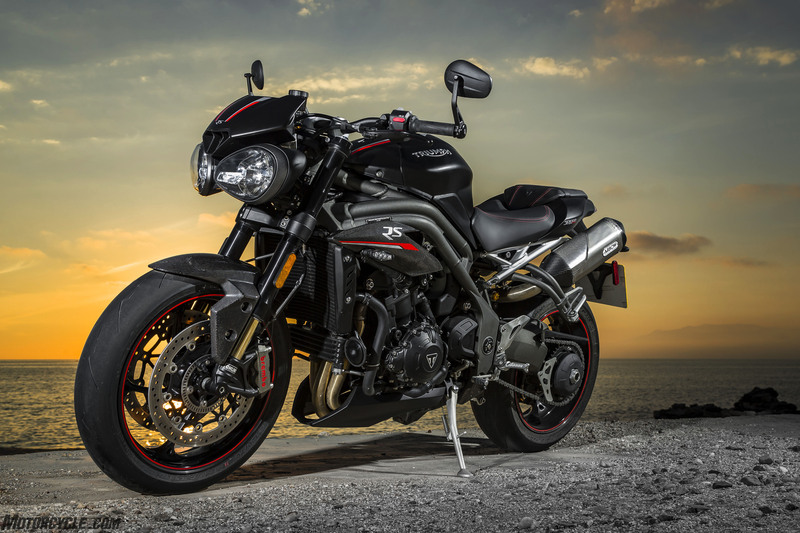 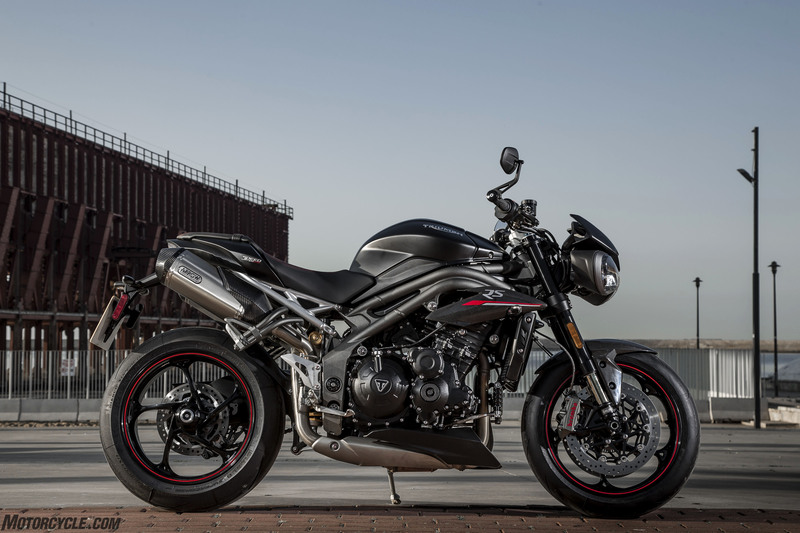 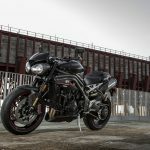 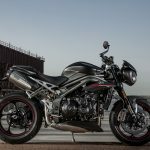 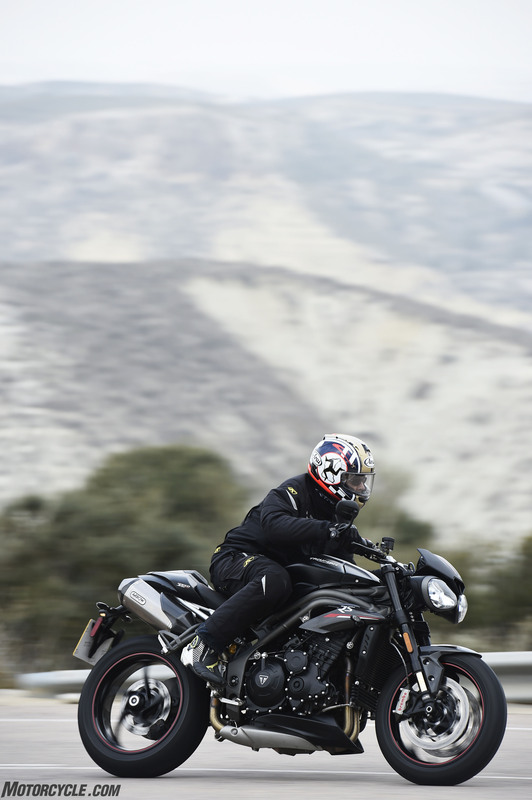 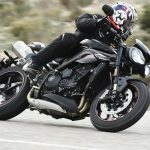 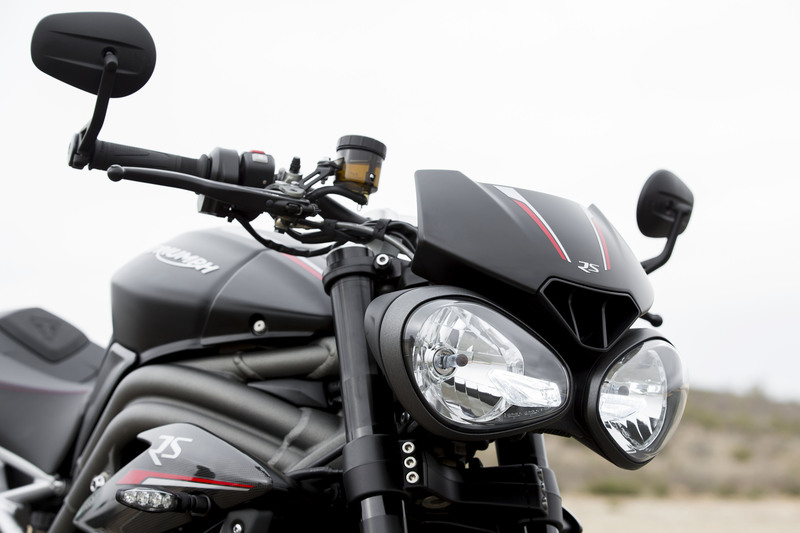 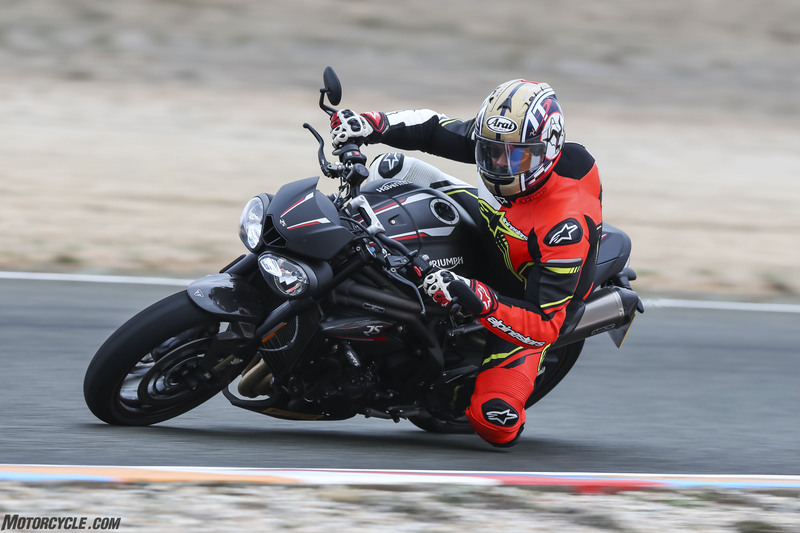 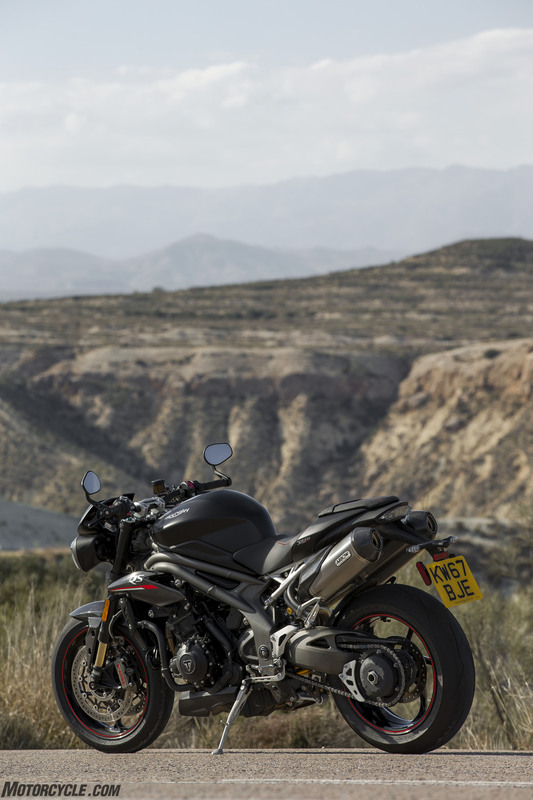 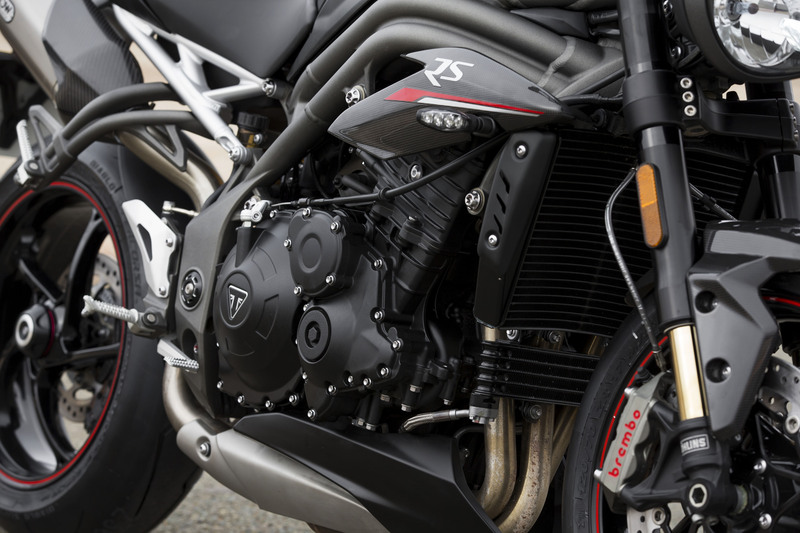 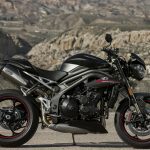 Triumph says the company improved the Speed Triple’s gearbox and slip assist clutch. 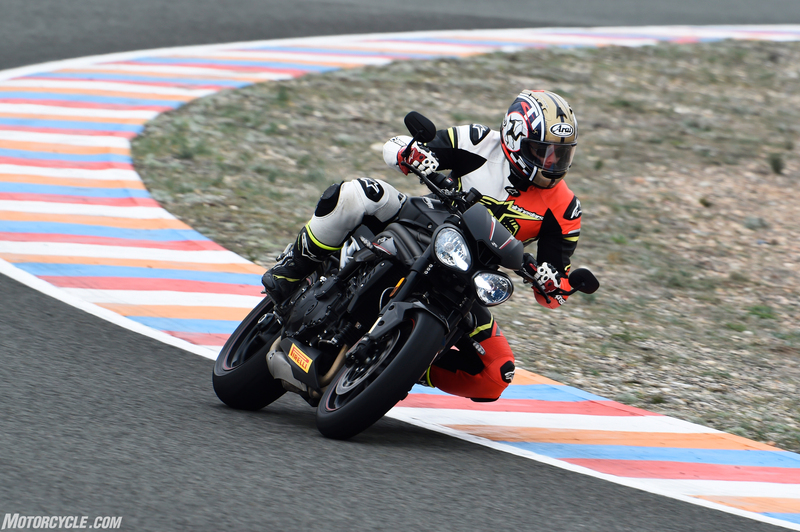 More importantly is the addition of Triumph Shift Assist which provides the advantage of clutchless upshifts/downshifts we all love so much. 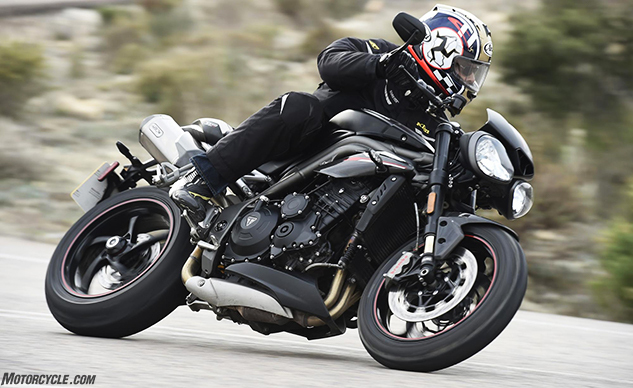 At slower around-town speeds the action can be a little clunky but the same can be said about a lot of quickshifter systems. 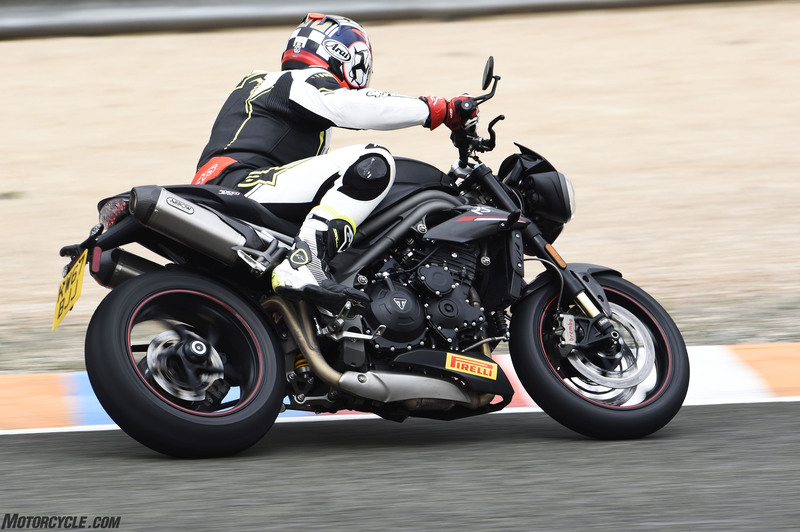 Once up to aggressive levels of speed the Triumph system seemed smooth and efficient, especially during our truncated stint at the track. 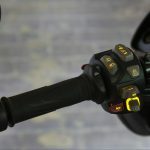 We all laughed a little when BMW’s S1000RR came stock with cruise control years ago but now nearly every sportbike above $10k comes so equipped. 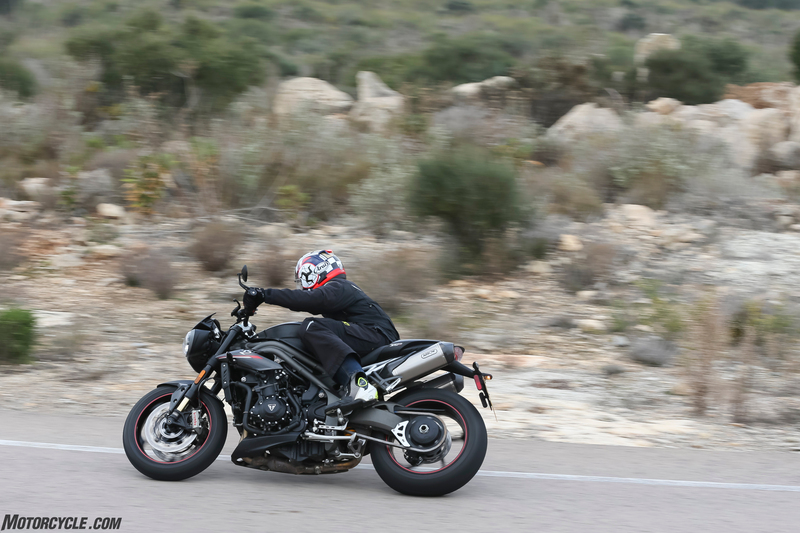 Considering the more comfortable nature of Speed Triple taking longer trips might be in the cards, but even during short stints of straight road riding, I find myself using cruise control just because it’s there. 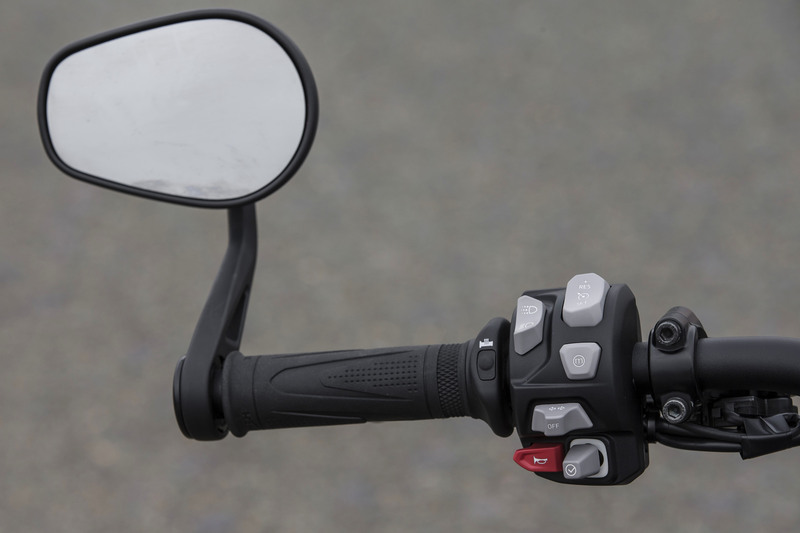 Like other units I’ve sampled, Triumph’s cruise control is easily adjusted up or down in one-mile-per-hour increments. 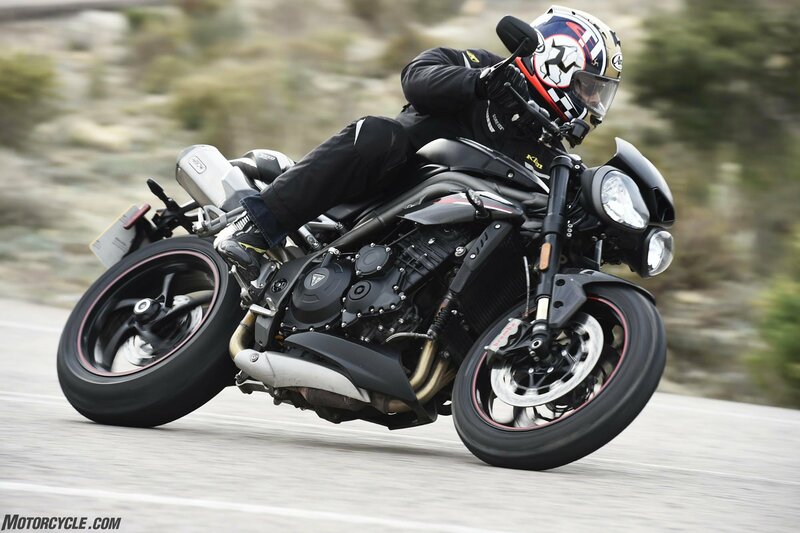 While the rain robbed us of testing the RS’s track mode setting, its up/down quickshifter and all its bevy of other improvements at speeds and lean angles only a racetrack can deliver, it’s streetable qualities – where this OG hooligan will spend most of its time – have assuredly delivered a Speed Triple worthy of its heritage. 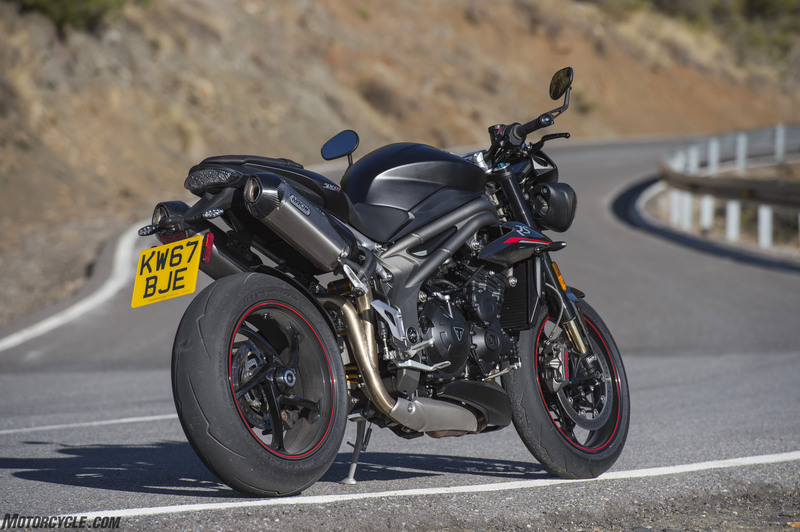 Even in 2016 the lesser-powered naked managed to defeat newer, more powerful competitors by virtue of its user-friendliness and real-world streetability, and the 2018 version continues those strong points only now with the creature comforts of a modern electronics package. 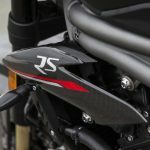 Retail pricing for 2018 is $14,350 for the S model and $16,350 for the RS, an $850 and $1,450, respectively, price increase over 2017 Speed Triples. 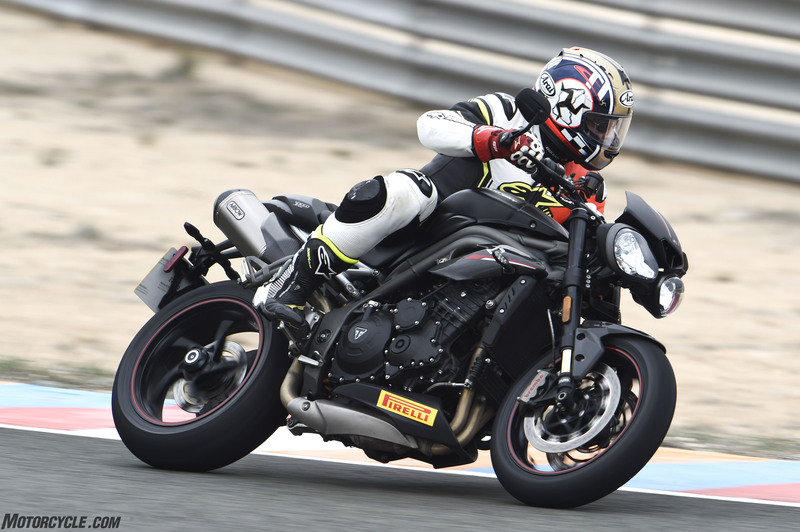 A reasonable increase considering all the improvements. 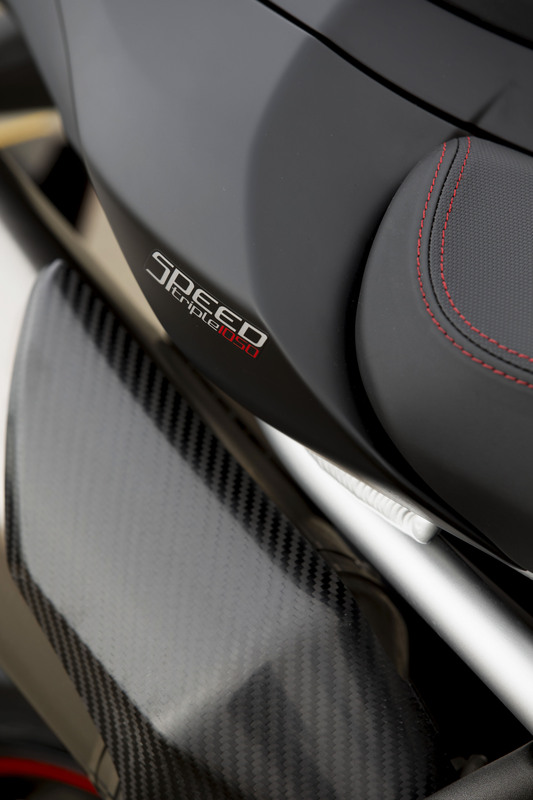 For what you get upgrading to the RS from the S model (Öhlins suspension, keyless ignition, cornering ABS, advanced traction control), the $2,000 premium is hard to overlook as a great value. 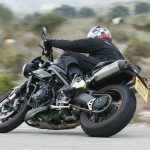 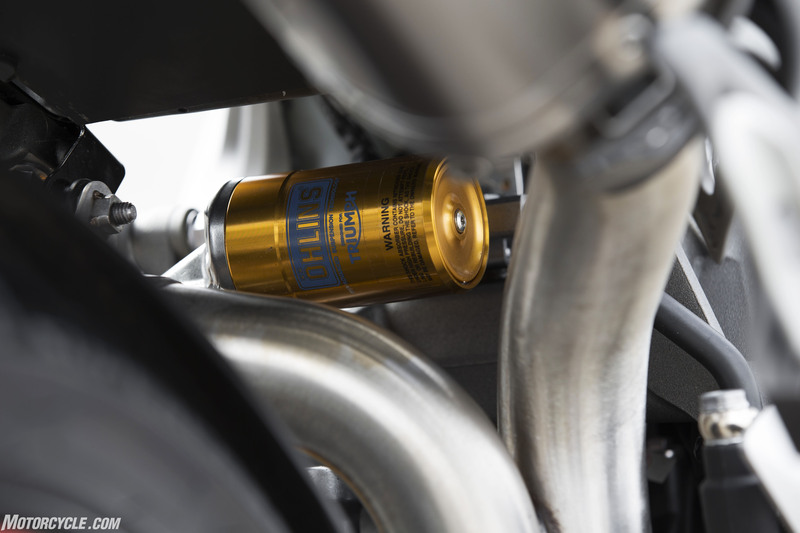 Some of the figures on paper may seem inconsequential – a half-dozen less pounds here and a few more horsepower there – but it all adds up to further refinement of hooligan that’s been a part of the motorcycling spectrum for nearly a quarter-century. 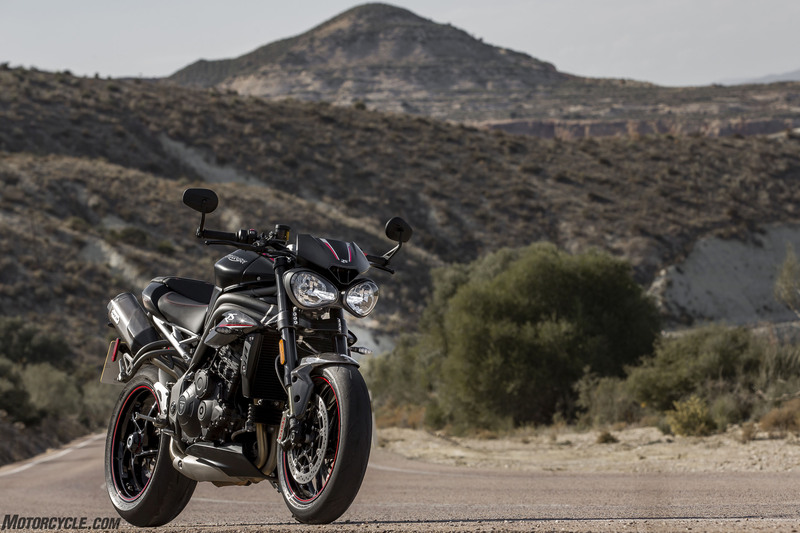 And its pricing certainly makes the Speed Triple attractive when compared to its Euro counterparts from KTM (SDR $18k) and Aprilia (Tuono RR $15.5k and Tuono Factory $18k). 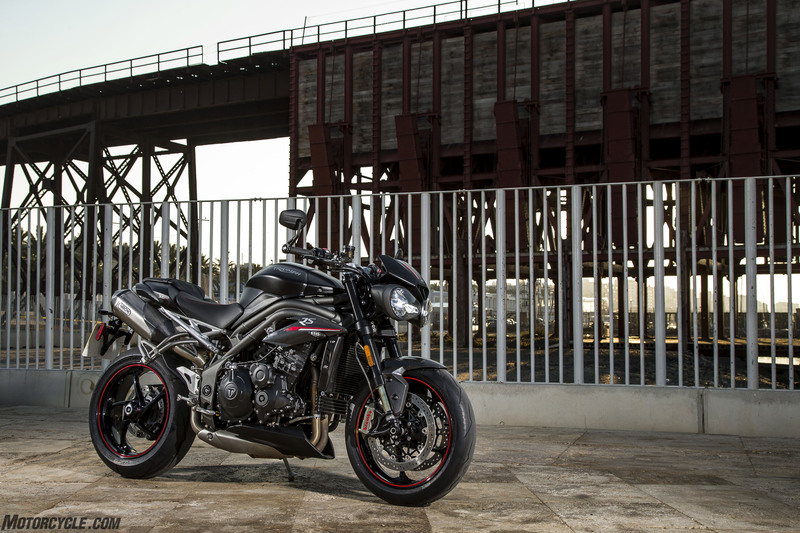 Triumph says the new models should be in dealerships by May, so you don’t have long to wait. 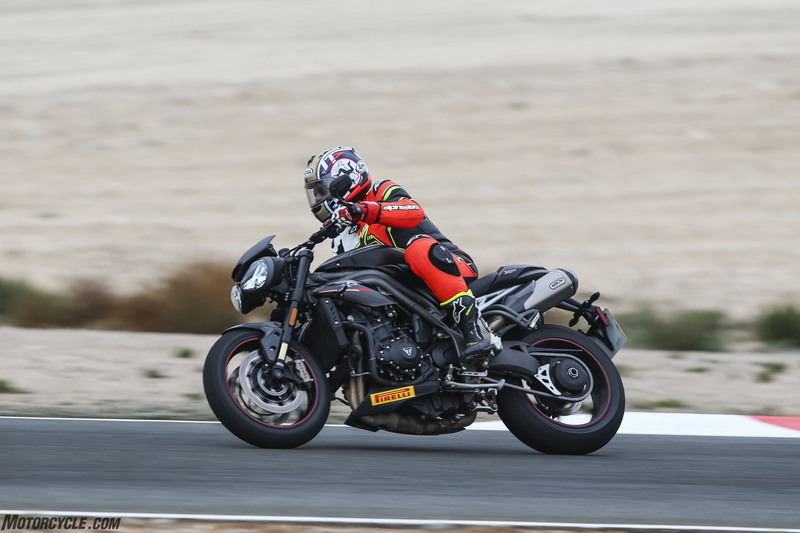 Our one session around a damp Almeria circuit provided me the opportunity to twice spin up the rear wheel and send it sliding out of alignment exiting corners, and that was with the bike in Road mode. 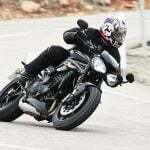 Thankfully I can report that traction control did its job and kept me from hitting the deck. 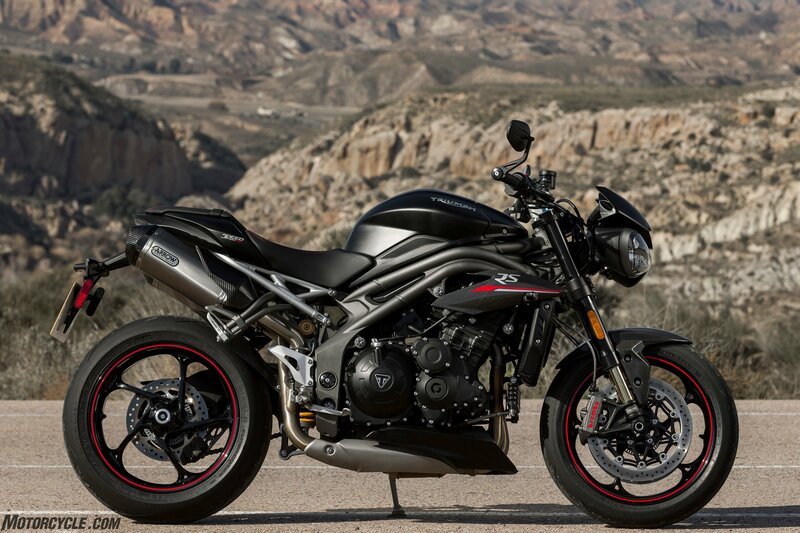 Get price quotes for Triumph from local motorcycle dealers.